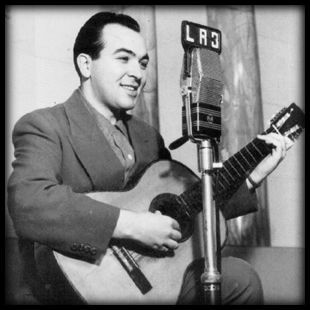 "Alma de bohemio" by Pedro Laurenz y su Orquesta Típica with Alberto Podestá in vocals, 1943. “Alma de bohemio” by Pedro Laurenz y su Orquesta Típica with Alberto Podestá in vocals, 1943. The appointment was at one of the venues where the figures that work in Buenos Aires by night are accustomed to meet: El Tío Felipe. There the charming talk of its thoroughly Italian owner makes even more pleasant the dialogue with an artist of our city song tradition in vogue since the 40s up to the present. For over half a century he has been in the crest of the wave, where he knew how to keep his balance, in spite of the waves and the tides that our tango music underwent during that period. «Roberto Caló, made me the connection to sing for the orchestra led by his brother Miguel. Its members where the most promising figures of the new generation of our city music. But among them there were two whom I want to highlight, because with the passing of time they would become my brothers-in-life: Armando Pontier and Enrique Francini. «The first four numbers recorded with Miguel Caló I made them under the name Juan Carlos Morel, because there were then other singers with the family name Podestá, which was my mother’s, but Caló was not willing to have any trouble with family names. «I gigged at the Singapur cabaret, located on Corrientes and Montevideo. I lived on Piedras Street near the corner with Alsina. Between one place and the other I used to get a streetcar at the beginning. Later when I started to earn my first “bucks” I used to take taxi cabs.